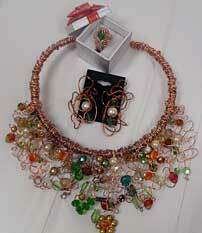 I am a free-form artist and I love to go with the flow of the beads and wire. When I add something to my designs, I stop and look and see if it looks good to me. I love the colors, textures, shapes of beads. It sounds strange, but I let them talk to me and if it feels right, I do it. I love working with wire. I have done numerous pieces with free form wire weaving. It fulfills my strong design capabilities. I loved the color of the wire and the feel of it from Fire Mountain Gems. It defined itself when I started working. I only began making jewelry about 8 months ago. 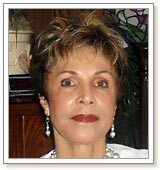 I live in Sun City Palm Desert, California where I joined an ongoing Jewelry Club. At first, I thought, there is no way I want to do that, it is too expensive. But then I found Fire Mountain Gems. Yes, I have 40 years working as an artist. I have been a graphic artist, an illustrator, an art-director, a sculptor, a painter and now a jewelry designer. Designing with shapes and colors has always been my strong point. I have won many awards for my logo designs and my first painting award was in the fourth grade. Our Jewelry Club orders thousands of dollars from Fire Mountain Gems. I do ceramics, I love making free-form ceramic pendants. I also paint. Yes, the Sun City Palm Desert Jewelry Club. I make jewelry pretty much full time. I have a bi-polar disorder and I find it keeps me from being depressed. I do sell my Jewelry. We have two arts and crafts shows during the course of a year at Sun City. I have won twice at the local bead shop, Monica's Beads, bead challenge. First time I won third place, second time I won second place. Take a lot of classes and join a lot of clubs. Enter as many contests as possible.You just never know what will happen.